Delhi: Cancer is a major cause for death and disease in India.According to The Indian Council of Medical Research (ICMR),there will be 17.3 lakh new cases of cancer, with breast, cervix and lung cancers being the most prominent, by the year 2020. The ICMR launched the National Cancer Registry Program (NCRP) to establish an age-wise gender based demographic profile of cancer patients. However challenges exist in the availability of updated data and figures for the public as well as key stakeholders. 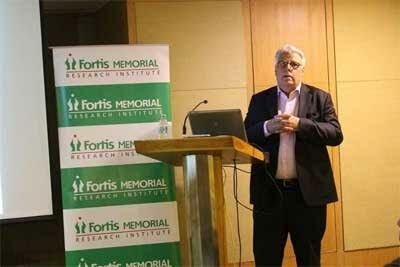 To address this concern, Fortis Memorial Research Institute (FMRI) instituted a registry in 2013 and is the one of the few private institutions in India which provides reliable data on the prevalence and trends in cancer in India.The objective is to help concerned authorities to make vital decisions to combat this deadly disease. There is a pre-devised questionnaire which records information on socio demographic, diagnosis, clinical extent of the disease, stage, treatment, prognosis of the disease etc. as recorded in the case records by the clinicians. The data is checked and validated using quality control programmes/tools followed by cancer registries of the InternationalAgency for Research on Cancer (IARC). Out of 15,664 hospital visits of cancer entries reported in 2014, about 2,157 (13.8%) were new cancer cases with 1,191 (55.2%) of these being males and women accounting for 966 (44.8%) cases. The median age at diagnosis of cancer was 54.0 years in males and 52.4 years in females. The highest number of cancer cases recorded from Indian states were from Haryana at 39.6 % followed by Delhi at 27.3 % and Uttar Pradesh at 12.7%. Of all new cases at FMRI, Tobacco-related cancers constituted 23.4 % of all cancers amongst males and 8.8% of all cancers amongst females. In males, lung (31.2%) was the common site followed by urinary bladder (16.5%), mouth (16.5%), tongue (11.8%) and larynx (10.0%). In females, cancer of the lung (36.5) was the leading, followed by esophagus (18.8%), urinary bladder (15.3%), mouth (12.9%) and tongue (10.6%). Paediatric cancers account for 5.8 % of the total cancer cases reported at FMRI during 2014. The total paediatric cancer load among boys and girls were 6.6% and 4.9 % respectively. The most common site of cancer, in boys between the ages of 0 to 14 years, is that of the nervous system followed by lymphoid leukaemia. While this amongst girlsin the ages of 0 to 14, is leukaemia followed by cancer in the nervous system. The disease affects about 11.5% young adults of all cancers seen and 57% population in their middle ages of all cancers seen. Geriatric cancers affect 25.7% of all cancers seen at the Centre. Dr Simmardeep Singh Gill, Zonal Director, FMRI said, “The Department of Oncology at FMRI has a very advanced and comprehensive cancer care programme with a trans-disciplinary and multi-modality approach in the field of adult and paediatric oncology. The FMRI Cancer Registry collects data on all new cases of cancer attending different out-patient departments of FMRI. It will enable us as well as other stakeholders in devising strategies to combat cancer on a large scale”.